There is a sense of inevitability about The Shining that grabs you by the throat and never lets go. The movie is a grandiose exercise in terror which favours stark imagery and subliminal horror over traditional storytelling. It is an experience that possesses you from the very outset, and from the seemingly innocuous overhead shots of Glacier National Park, Montana, you are saturated with a palpable sense of inescapable doom. Novelist Stephen King disliked Kubrick’s adaptation, particularly the casting of one Jack Nicholson in the role of manic patriarch Jack Torrance. King had actually written a screenplay for the movie, which Kubrick had quickly shot down, describing the author’s writing as ‘weak’, but as bitter and sacrilegious as King’s criticism may sound in reference to one of the genre’s most mesmerising performances, his words are not ill-founded. In fact, King’s thoughts on the character echoed my own to some degree. While watching The Shining, I briefly took issue with the fact that, rather than descending slowly into madness, the Torrance character seemed somewhat deranged from the outset. During his interview for the caretaker’s position, Jack’s ironic responses seemed like those of a man at the end of his emotional tether, while a second trip to the hotel with his family paints a character steeped in perversity as Jack glibly discusses cannibalism with his young son, Danny (Danny Lloyd). King questioned the sense of using an actor who oozed craziness from the beginning for a story which focuses on a man’s steady deterioration. Stuart Ullman: The police thought that it was what the old-timers used to call cabin fever. A kind of claustrophobic reaction which can occur when people are shut in together over long periods of time. King had a point, but in hindsight, I don’t believe it’s a question of right or wrong. As I have already stated, this is a movie driven by an almost intangible horror, and it is arguable that the insidious aura of the Overlook got under Jack’s skin from the very beginning. After all, this is a character with a history of drink and violence, weaknesses that would make him all the more susceptible to the hotel’s inimitable capacity for persuasion. When discussing his affinity with his new, temporary home, Jack tells his family that from the moment he first arrived he felt as if he had been there before, a remark made all the more disquieting by ethereal waiter Delbert Grady’s claim that Jack had always been the janitor. Grady also claims that he did not hack his wife and kids to pieces as the hotel manager had earlier revealed. This, it seems, is a fate reserved for Jack. Whether you agree with King or not, this is very much Nicholson’s movie, and although his maniacal grin and frame-swallowing panache may detract from the character’s arc on some level, it adds so much to the movie that you struggle to imagine it without him. It takes a certain presence to take centre stage in a movie stamped with Kubrick’s colossal thumbprint, and Nicholson would turn to method acting in order to build up to the almost comical frenzy that leaves his audience treading a precarious line of horror and humour. The snapping, thrashing beast who stalks the hallways of the monumental overlook is just as unsettling when raising an eyebrow as he is staring with a statuesque insanity that defies all human emotion. So involved was the actor in his role that he would write an entire scene based on his own marriage troubles, while the movie’s iconic ‘Here’s Johhny!’ line was his own improvisation. Nicholson’s is a performance of incredulous devastation, and the sheer fright that tarnishes the glow of Wendy’s angelic pallor is reflected in all of us. Jack Torrance – Wendy, listen. Let me out of here and I’ll forget the whole damn thing! It’ll be just like nothing ever happened. Wendy, baby, I think you hurt my head real bad. I’m dizzy, I need a doctor. Honey, don’t leave me here. With that image in mind, it is difficult to deny that Shelley Duvall’s performance is just as essential to the movie’s effectiveness. Wendy’s character may live in the shadow of Nicholson’s iconic turn, but her fragile strength is key to her co-star’s maniacal power, and her distraught image is just as unsettling and iconic. This was great casting in the first instance, but her legacy did not come easily. Duvall’s relationship with Kubrick was notoriously strained, such were the demands that he put on her during filming, and the actress claimed that she was “in and out of ill health” during the often laborious shoot. The most famous example of Kubrick’s demanding nature can be found in the Guinness Book of Records. The scene in which Wendy limply swings a bat at an approaching Jack took an exhausting 127 takes to complete, the most for a scene with spoken dialogue, and perhaps an explanation for the wraithlike creature who appears onscreen. It is this kind of attention to detail that makes the movie so richly compelling, leading to years of debate and discussion regarding such infinitesimal details as lamps visibly unplugged while the Overlook’s lights continue to glow, peripheral images designed to disorientate. Much has been made of the subliminal content featured in The Shining, a plethora of conspiracy theories resulting in Rodney Asch’s documentary Room 237, and although I won’t discuss them in too much detail, the movie is littered with subtext and moments of abstract horror which have a startling effect on the senses. Take the scene in the infamous Room 237. Jack is approached by a beautiful woman who advances on him in a sultry manner, but only after they have embraced does he discover her true form in a reflection, while a nonlinear image of her decaying corpse rising from a bathtub leaves us feeling as disorientated as the retreating Jack. Danny Torrance – Do you like this hotel? Jack Torrance – Yes, I do. I love it. Don’t you? Danny Torrance – I guess so. Jack Torrance – Good. I want you to like it here. I wish we could stay here forever. Perhaps the most recurrent theme in The Shining is that of being trapped in a maze, which ultimately proves to be the centrepiece of the entire movie. When Wendy and Danny are given the tour of the kitchens by fellow ‘shiner’ Hallorann (Scatman Crothers), the timid mother jokes that she would need a trail of breadcrumbs to find her way out, a comment that Danny picks up on and utilises during the movie’s maze-bound climax when he lays false tracks for his pursuing father, resulting in one of the most shocking and iconic images in the entire genre. The sense that we are trapped in a perpetual maze is key to the movie’s overwhelming sense of claustrophobia and isolation, a fact punctuated by an image of Jack peering over a model of the aptly named Overlook, one which transitions seamlessly into an overhead image of Wendy and Danny exploring the real thing. The design of the hotel’s carpet is a maze within itself, while Danny’s iconic journey through the corridors on his tricycle sees him wander as if deep into a forest, the sobering sight of the hotel’s resident twins, hacked to pieces in subliminal flashes, the only thing preventing him from wandering deeper. Grady Twins – Hello, Danny. Come and play with us. Come and play with us, Danny. Forever… and ever… and ever. Sound, as in the changing tone of Danny’s wheels on carpet and wood, is also a vital element in creating a knife-edge tension. Early on, we have the mildly disquieting sound of Jack’s ball echoing through the giant space of his writing quarters, its disturbance growing in correlation with the ferocity of his throws. We hear the sound of Jack hammering at the keys as he types out his infamous ‘All work and no play makes Jack a dull boy’, while the movie’s score tramples on your nervous system in violent flashes, playing your spine as though it were a rusty cello. But beyond the slowly disorientating attention to detail, it is those truly cinematic moments that stay long in the memory. 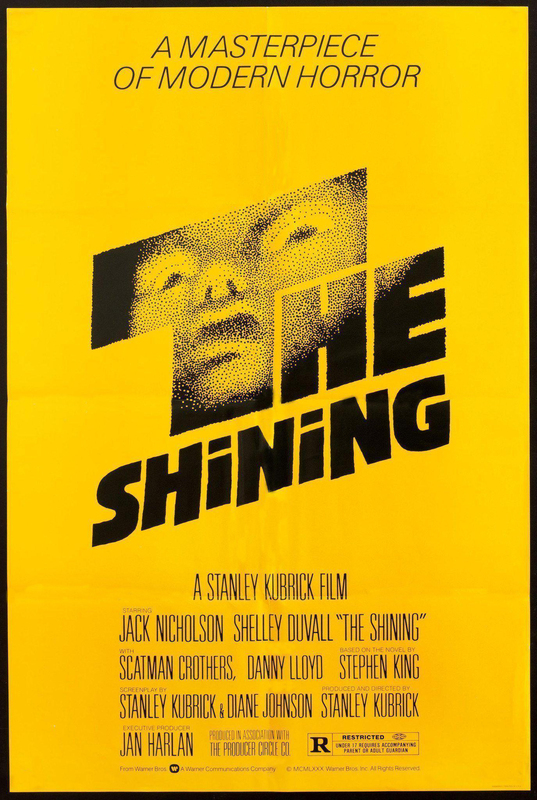 Whether it’s a deranged Jack peering through the hole in the door, Duvall’s trembling Wendy or Danny’s foaming fits of insular panic, Kubrick succeeds in etching his intensely bleak and disruptive vision deep into your memory banks. The director had that ability, and though he produced a catalogue of work that is varied in both subject and genre, his style is one of the most distinct in all of cinema. And so we arrive back at that notion of inevitability, and the sense that Jack is doomed from the very outset. There are scenes in The Shining, as when Wendy and Danny sit watching television, that are distinctly photographic, and the fate of our characters seems just as static and unwavering, as if they were captured in a moment that is destined to last forever. Fittingly, for the movie’s closing shot, that is exactly where Jack ends up, framed in a photograph as if banished to the annals of Overlook folklore, a place where his perpetual grin seems right at home. I’ve been waiting for this one! The Shining is my favorite movie of all time when I’m inevitably asked at parties or by acquaintances I’m getting to know. Why? It’s tough to say. It’s directed by my favorite director of all time, Stanley Kubrick. It stars my favorite actor of all time, Jack Nicholson. The movie’s genre, horror, is my favorite movie genre as well. Or all 3 of these people & things my “favorites of all time” because of The Shining? I don’t know that for certain, but all I know is the movie’s combination of cinematography, acting, story, dialogue, directing choices & pacing are all perfection in my eyes. It has to be up there as one of the finest movies ever made. For me it’s such a visceral experience. It’s a movie you feel. 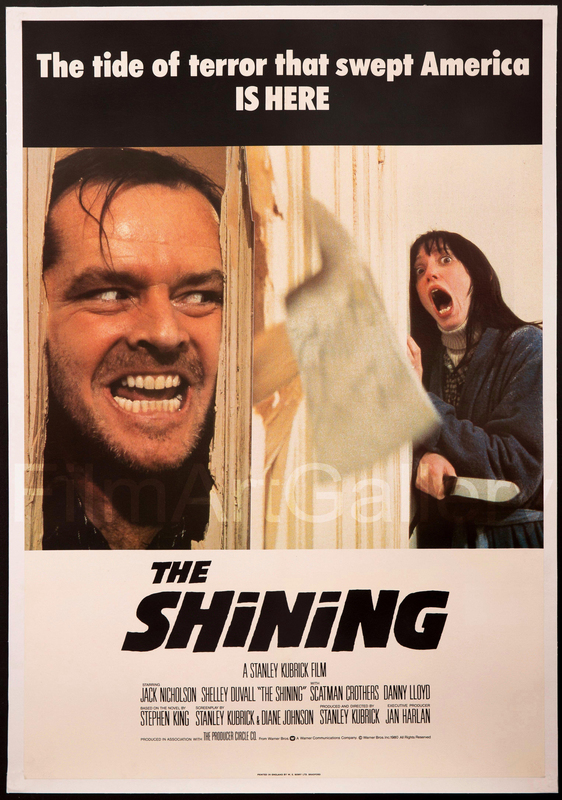 Nicholson is outrageous in this movie, as is Shelly Duvall, although that seems to be the product of Kubrick’s torturous treatment of her by all accounts. The word Masterpiece gets thrown around far too frequently, but this is a genuine masterwork of striking beauty, with labyrinthine layers that leave you feeling as helpless as the isolated cast.